Bullfrog; photo by Eric Bégin on Flickr (noncommercial use permitted with attribution / no derivative works). The bullfrog is the largest frog native to North America and can be found in every county of Missouri. A fourth grade class at Chinn Elementary School in Kansas City came up with the idea to make the bullfrog a state symbol of Missouri. The voice of the male bullfrog, used to attract females, is a vibrant series of bass notes with a distinctive sound best described as "jog-o-rum." The loud, guttural bellow carries a long distance, giving the impression of a much larger creature, which is an advantage in keeping predators away. 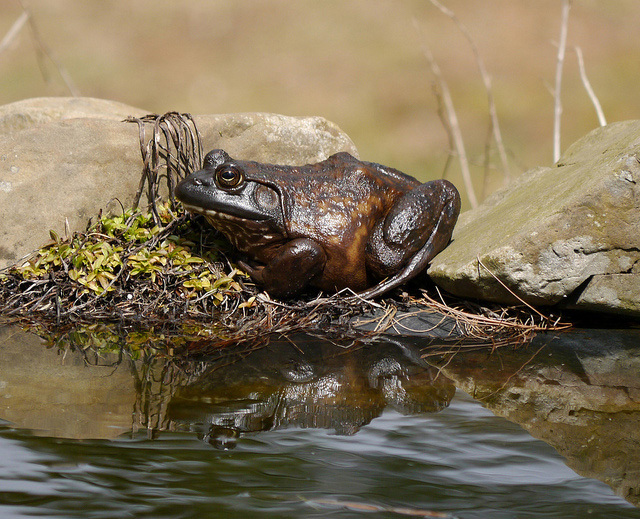 The bull frog has large talons and is an opportunistic predator eating anything it can swallow including beetles and other insects, small turtles, snakes, birds, worms, crustaceans, tadpoles, and frogs (including other bullfrogs). Bullfrog coloring varies - they are generally varying shades of green or brown, with dark brown, dark green, or black blotching and a yellow or white underside. Females are usually larger than males. 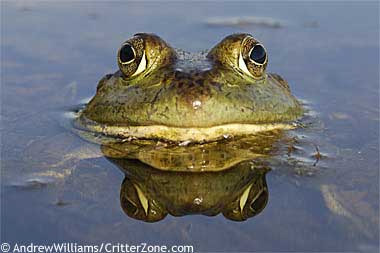 Bullfrogs are present year-round (burrowing into the mud beneath the water to hibernate in winter). The versatile and prolific bullfrog is an integral part of the ecology of Missouri and represents the importance of all species of amphibians to the environment and the state. 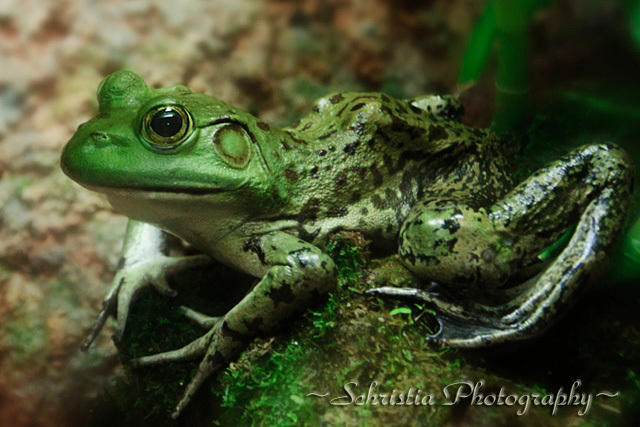 Bullfrog; photo by Schristia on Flickr (use permitted with attribution / share alike). 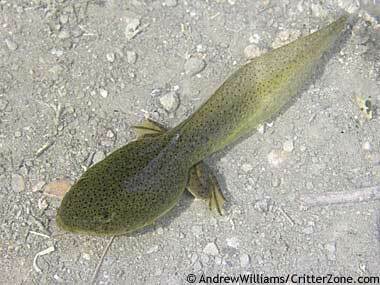 Bullfrog tadpole; American bullfrog tadpole; photo © Andrew Williams / Critterzone: Animal Pictures, Nature Stock Photography (all rights reserved; used by permission). 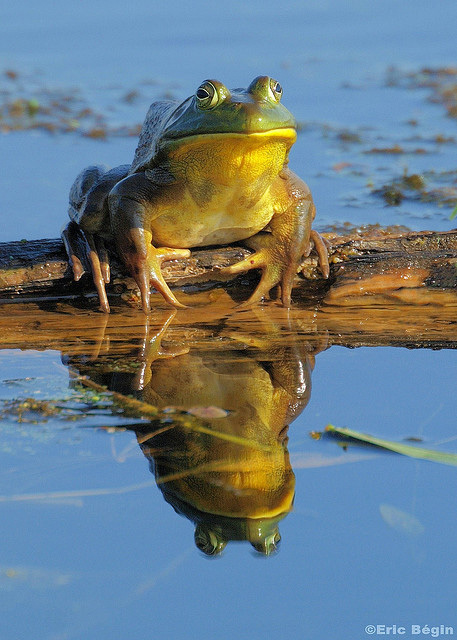 North American bullfrog; photo © Andrew Williams / Critterzone: Animal Pictures, Nature Stock Photography (all rights reserved; used by permission). American Bullfrog (Rana catesbeiana); photo by Kristi on Flickr (noncommercial use permitted with attribution / share alike).